Thanks to all those who entered and don't forget to enter the Sears $50 Gift Card, Mikisso $220 Hana Flat Iron or any of the other giveaways. Make sure you subscribe to know the latest giveaways with more coming soon! random.org is used to select from eligible winners. Did you know by adding Progresso Light and 100 Calorie Soup into your weight management plan, it might help you achieve your weight loss goals? As part of a MyBlogSpark campaign with Progresso Soups, I received a complimentary "Souper You Debut" gift pack that included 15 cans of soups, a digital jump rope and a really cool, big soup mug from Progresso through MyBlogSpark. As soon as they arrived, we decided who was going to try what to give a thorough review of the variety we received. There are over 40 varieties 100 calories or less so there are no excuses! I also like how Progresso offers choices such as High Fiber, Vegetable Classics, Light, Traditional, Low Sodium and microwave. My favorites included the Progresso Light Italian Style Meatball which is new. If you are on Weight Watchers, it even has the point listed to comply easier. The can has two servings at 80 calories each so at 160 calories for an entire can, that's wonderful for my diet plan. Of course if I was going to be really good, I'd only eat one serving but it was too good and my two year old was competing to eat it. I watch carbs as well and it only contained 13 grams so that is another plus for me. The taste was light but delightful and fullfilling. The Progresso Light Beef Pot Roast is delicious at only 80 calories again. The thing with the Light soups that I had to point out to my husband is they are lighter in calories and so you don't get that same rich flavor of a fat laden, calorie overloaded soup. I prefer knowing that I'm putting something healthier into my body that will help me feel full, lower my caloric intake while givine me some great tasting. 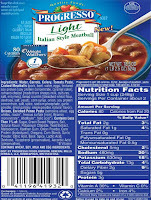 I really enjoyed the taste of this soup but my favorite is strill the Progresso Light Italian Style Meatball. My oldest daughter tried the Light Chicken Noodle soup and also enjoyed the flavor. She's on a get in shape kick too so she appreciated a chance to eat "real food" while not overindulging in calories. Stay tuned for more updates to the varieties as there were 15 cans in total! Between January 4th (yes, I know it's past January 4th) and March 15th, you and I can visit www.Progresso.com/SouperYou and enter the Progresso “Souper You Debut” contest for the chance to win a full makeover in New York City. I don't know if you have ever been to NYC but I have and lived there briefly and I can tell you that it is an experience that you can't miss out on! THREE grand prize winners will be awarded a trip for two to New York City from May 21st-23rd. The prize includes roundtrip airfare, a two-night stay in a NYC hotel, a full makeover, a $1,000 wardrobe shopping spree and personal consultation at a New York department store. I would LOVE to win this, how about you? Once you enter, you’ll have the chance for your photo and/or an excerpt from your essay to appear on www.Progresso.com/SouperYou, so be sure to check back frequently! Once the 10 finalists are announced, you can visit www.Progresso.com/SouperYou from March 29 through April 12 to vote for your favorite. In addition, throughout the duration of the contest you can visit www.Progresso.com/SouperYou to download a coupon for $1 off any three varieties of Progresso Soup! With surprisingly hearty ingredients like pasta, beans, corn and rice, and flavor-packed vegetables like tomatoes, carrots, and peppers, Progresso Light and 100 Calorie Soups offer varieties with a good source of fiber and a full serving of vegetables. Satisfying your taste buds, Progresso Light and 100 Calories Soups can help curb your hunger, making it easier for you to stick to your weight management plan. One of my readers will receive their own Progresso Gift Pack that includes two cans of Progresso Soup, an electronic jump rope and a great mug to enjoy the soup with! Follow my blog and tell me what soup you would like to try by clicking here. Giveaway ends 2/14 at midnight. Winner will be chosen by random.org. In the light variety I'd like to try the Zesty Santa Fe Style Chicken! Progresso traditional Italian Wedding is my favorite. I'd like to try the light Italian Style Meatball. I think I'd like the Traditional Chicken Noodle. I would like the Chicken Barley Soup! I follow your blog and I would like to try the pot roast! I'm a member of MyBlogSpark! Follower as Wanda, and I'd like to try the Light Homestyle Vegetable and Rice. Thank you, Judy! I really enjoy Progresso, so this will be a very welcome prize, indeed! I'll think of you (and thank you) with every sip!